Are you looking for some kind of shelving unit to help you clear out the clutter or showcase items you take pride in around your home? If you are browsing the market, you might notice that shelves can cost a pretty penny and require assembly if you do not want to pay an additional fee; if that option is even available. If you have to assemble the parts together, why not just build your own shelving unit at a possible lower cost instead? Take some time to listen to the host in this video and see how you can build your own industrial pipe shelving unit! Did He Say You Could Make a Shelving Unit Out of Industrial Pipe? Yes he did! Average shelving units are typically made of wood, metal or plastic. However, you can let this DIY project show you how to make shelves with the use of industrial pipe! If you initially have doubts because industrial pipe is not a common material for this type of product, rest assured your experience will not be disappointing. The video can tell you how and why! 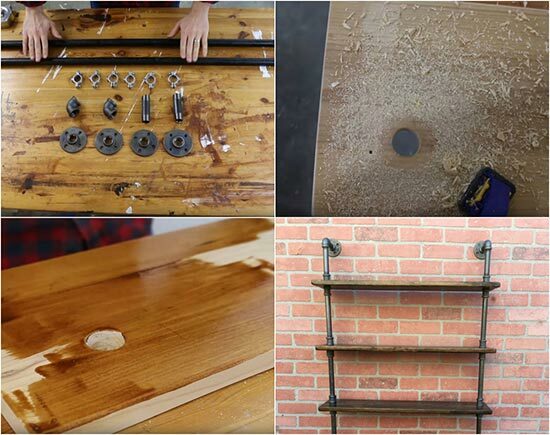 What Can the Video Tell You About Making an Industrial Pipe Shelving Unit? This type of project requires more than just item one, item two and a screw to keep them together. The video explains everything you will need to complete the shelf and fortify its dependency. Power tools are necessary for building the shelves and the video will show you which ones are needed at specific steps. The video will describe how to use the tools, materials and perform accurate measurements for successfully building the shelves. Most importantly, the video will tell you how to build the shelves to be both sturdy and reliable.